Pineapple is one of the tropical fruit that much-loved in their own country. The sense of acidity in the pineapple, often make pineapple made a variety of culinary dishes such as pickled or as a complement to recipes. 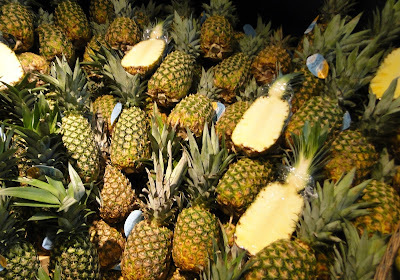 Currently getting pineapple is also not difficult, we can find it in traditional markets or supermarkets. For people who loves the pineapple so much, it such a pleasure when eating that and try to saved the health benefit of pineapple. Lots of benefits that can be obtained from pineapple fruit are because it has antioxidant content such as vitamin C, B1, potassium, and manganese high enough. Also, many other contents help prevent the coming of the disease. Pineapple is filled with phytonutrients that work as a remedy to reduce some of the symptoms of the disease and the general condition that may occur today. So, don't be doubt, you will get the advantages by consuming pineapple. The benefits that we can get from pineapples include protection against cardiovascular disease, increasing fertility, overcoming inflammation, and much more. Here are five benefits we can get from pineapple fruit. The first pineapple health benefit is provided support for the synthesis of collagen in the body. The synthesis of collagen level is high, so it will resulting more elastic skin. Also, The vitamin C and amino acids will give influence to damaged cells. Use a fresh pineapple juice on the face then wash it with warm water after 10 minutes. Pineapple is beneficial for heart health because it contains potassium, vitamin C, and fibre. The pineapple juice has the high cardio-protective ability. Besides that, the pineapple juice could reduce the coronary heart disease and can smoothen the absorption process. The next pineapple benefit for health is contained manganese. This is present in abundant amounts in the pineapple and helps strengthen bone and connective tissue. A cup of pineapple juice will give you about 73% of the manganese needed for the day. A study showed results that manganese along with other minerals might be helpful in preventing osteoporosis in menopausal ascending women. The benefit of pineapple for eyes health prevents the macular degeneration. It is a condition of adults who experience vision loss. This disorder causes difficulties to read and recognize things correctly. The beta-carotene substance containing in pineapple can empowers sight and must regularly be consumed for eye health. Someone who tends to have high blood pressure would undoubtedly try to make blood pressure back stable. The right choice of food to be one of them, namely by considering the pineapple diet for hypertension. The amount of potassium content is high as found in the benefits of bananas. But containing low sodium content will help maintain healthy blood pressure levels. After you know the health benefit of pineapple, you also oblige to know your body needs. Consuming pineapple too much isn't recommended. You make it a juice at least twice a week.